The influence of wellness continues to bleed into other categories beyond supplements, fitness and health food, reaching particular resonance in skincare and beauty categories. Meanwhile, consumers are becoming more educated and empowered, demanding to know what’s in their products and why. 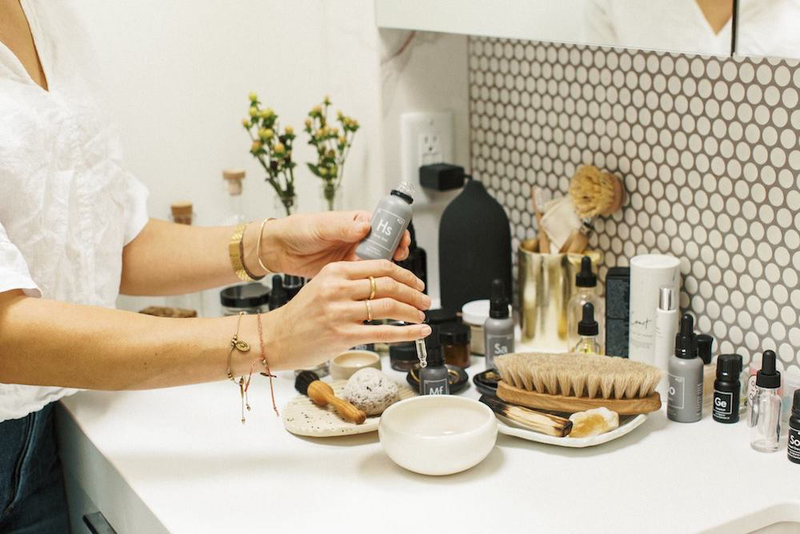 Billing its product range as “dynamic skincare,” Vancouver-based brand vitruvi is quickly establishing itself within an increasingly crowded market for natural and organic beauty products. Key to vitruvi’s retail strategy is an element of customization, allowing shoppers to tailor their own blend based on specific needs. The brand provides education when necessary, encouraging self-care above simply seeing physical results. On shelves and ecommerce storefronts with retail partners including Sephora, Anthropologie and Goop, vitruvi is building its brand by simply being in the places its core demographic might already be shopping for skincare and personal care items. Roseanna spoke to virtruvi co-founder Sara Panton about how she uses knowledge gained from medical work around the world to inspire a new kind of wellness brand, and how she keeps in touch with a customer base as it grows. RR: Could you describe your background and how you came to found vitruvi? Sara Panton: vitruvi was really a passion project. My co‑founder and brother, Sean, and I grew up in a really small farming community that didn’t even have a traffic light and was right on the water, with lots of farms and apples and fruit stands. Our parents were early adopters of the organic movement, way before it was cool, which we really took for granted. It instilled in me an interest in wellness and different cultures. I went on to do a degree in Global Health with a focus on immunology and infectious disease, and took a lot of courses in medical anthropology, working abroad in Kenya and Morocco. I was so fascinated by cultural practices from different places in the world and what we could learn from them. From there, I went on to medical school. My hope was to specialize in women’s wellness and preventative medicine, and work abroad. I helped set up a safe birthing center in Kenya. I thought I was going to be working in a tiny town in the middle of east Africa. What ended up happening is that, in my first year, we were learning about the cranium and the olfactory nerve. It’s how you smell. I became so fascinated by the senses. It’s so powerful how smell affects the brain, and so underutilized. Fast forward, I came home one day, and Sean had moved to Vancouver to go to business school. I had created a scent blend that helped me during studying, because I was having test anxiety. From there, we started creating our own product line. It began as a blog. It was a website where I would write articles from my bathtub about different health and wellness practices in different cultures. I would interview people about their daily wellness rituals. We created a super‑simple line of products, really just for our friends and family. Then we started getting interest, right around the time that the wellness movement was starting. We quickly got inbound interest from stores like Urban Outfitters and Anthropologie. It all compounded from there. I never finished medical school. By my second year it was all that we were doing on our lunch hours. We were bottling products there by hand and mixing them. I still have dents in my left hand from assembling roller balls. How do you see the wellness industry evolving? I definitely see it evolving towards incorporating different practices—everything from acupuncture to scent and botanicals. At vitruvi, we think about taking traditional botanicals from around the world and repurposing them in a modern way. I think that our current North American society has lost a sense of ritual and ceremony, which is the basis for a lot of cultures around the world. Whether that’s drinking chai together or making rice and having dinner as a family, or different bathing practices in Morocco with block soap and scrubbing, it’s really important for the brain and body to have ceremonies that help establish a sense of consistency. We have such a frenetic life with alerts and our phones and travel schedules and time zones. What I’m seeing is an exploration of modern ceremonies that people are looking to create throughout their day that add smaller wellness moments. The former wellness movement was really focused on fitness and sweat and intensity. I’m seeing that softening in my experience. How do you see wellness crossing into the beauty space? What was behind your decision to move into that category with skincare? Look at some of the larger retailers, like Sephora launching wellness and bringing on some vitamin companies, and companies like us that talk more about managing stress and different ways to take care of yourself, as opposed to topical treatments with instant results. People are applying that understanding of wellness, understanding that stress shows up on your face, and that there are ways to get to the root of some of those issues like blemishes or breakouts or that could be tied to diet, or weather. For me I’ve always thought that it’s really important for a woman to take time to check in with herself and think about how the things that are happening in her life might be showing up on her face. I would feel relatively confident in saying that a lot of women put other people before them. Our face oil collection is the first under our dynamic skincare umbrella, and the idea is that a woman should have skincare as dynamic as her life, changing by the day and the time of month and what’s going on in her life. We launched it because there was an interest from our community. We’re always talking to our fan base on Instagram and through our blog. We wanted a way for people to use essential oils, which at our core is the foundation of what vitruvi is, and create a home apothecary for their skin. How does the skincare line fit into the larger brand strategy for vitruvi? That practice of being able to create your own products really will be the foundation of it, much like how we launched our essential oils. The three‑step system that I designed is meant to be customized, but is also really simple. The first step is choosing a base oil, based on the moisture level that your skin needs. The second step is choosing complex oils. Those have a little more punch to them and have more targeted benefits, whether it be calming, or glowy skin. The third is adding one to three essential oils, for both the scent as well as the properties of those oils. Was the customization aspect important for your consumers? What is your target market? We know our customer really well because we talk to her every day. We ask questions and create two‑way conversations as often as we can. When we were building this line, we thought a lot about how much time our customer has. All of this should be able to be done in less than two minutes, and to happen in the palm of your hand. It’s a Choose‑Your‑Own‑Adventure. 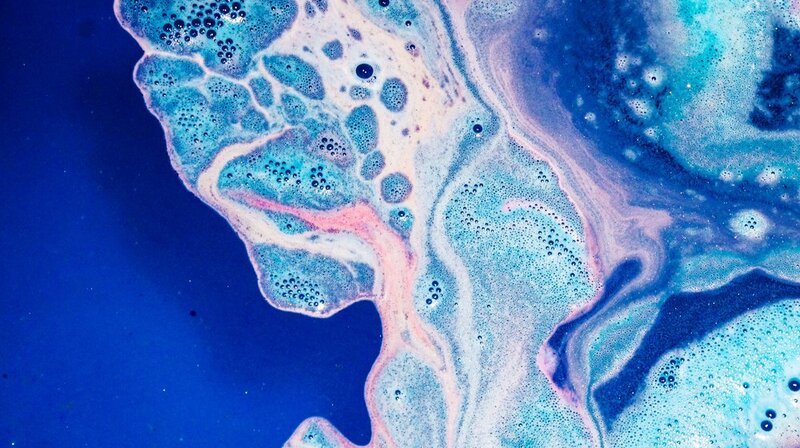 We have products that customers can just buy and use if they want to start integrating essential oils and natural body products, and then we have things that are a little more customizable. It’s a two‑way conversation, with our influencers online and our customers. Having customers use and be curious, mixing our products in different ways, is really exciting for us. Besides online, how else do you build engagement with customers? It’s still early days for us. We do blending events and I’ll design a facial for someone. I think the customers are still used to being told what they should put on their face. We’ve seen that empowerment in the food movement with people being really discerning about what’s on the ingredient label and when to eat it. I haven’t seen that switch in beauty yet, and customers are still apprehensive if they’re using things correctly. They’re still looking for that guidance. But if they’re using high-quality, pure, natural ingredients, they really can’t mess up. What’s exciting for us is people taking ownership of their skincare. Our customer experience is incredibly unique. We’ve scaled it so that customers can call our team and have a conversation with them. We’re happy to help blend the oil on the phone with them or walk through the different set profiles of our essential oils. It’s a digital first brand. Our website is our storefront. We interact with our customers as if they were just walking into our store. On social media, how we speak to them just like if we were talking face to face, and that extends to our customer experience and how we design products. We ask a lot of questions through our social channels as well as when we’re at an event. Then our customer experience team tracks data around things that are being asked for. Finally, can you tell us about your partner strategy, and how it’s helping to build your future? Because it was Sean and I just building it from the get‑go, it was really important for us to partner with retailers. We wanted to take a new approach that really understood our customers and what places she already shopped. We were discerning where vitruvi would show up in real life. We thought about where she shopped for beauty, body and home, places that she’s already going to when she wants to try or smell a product. We have partners at GOOP for over three years now. It’s exciting because they are willing to push the boundaries in terms of content and discovery, which is something that we feel passionately about. They’re an incredible team to work with. They’re outstanding at what they do and are some of the kindest people I work with professionally. They listen to their customer in a similar way that we do at vitruvi. Sephora had actually reached out to us about two and a half years ago for me to be part of the Sephora Accelerate program. They would invite 10 female CEOs and put them through a program where we were able to meet their whole executive team and learn from them. Part of that was a lot of learning in focus groups and understanding how wellness is evolving for the Sephora customer. A lot of our products have been designed in talks with the Sephora team and understanding beauty trends on a North American and global scale. We’ve been the first test kitchen and supplying a lot of information on our end as well around how the wellness and beauty space is evolving and even understanding projections and forecasts for how we plan accordingly for store experiences. It’s been definitely a two‑way learning experience. Sophia Amoruso is the founder and CEO of Girlboss, an organization dedicated to providing support for women at all stages of their careers, with everything from wellness resources to financial advice. She got her start as the founder of online retailer Nasty Gal, which rode the wave of early millennial-oriented ecommerce to great success until its very public bankruptcy filing and acquisition by BooHoo Group in 2017. Along the way, Amoruso collected her wisdom gleaned as leader of what was once one of the internet’s fastest growing retailers into #Girlboss, an autobiography offering advice to other ambitious young women. Since stepping down as CEO of Nasty Gal, Amoruso has dedicated herself to building Girlboss, creating an annual Girlboss Rally, online content, a podcast, and a recently announced private networking platform for professional women. Launching in 2019, Amoruso hopes the Girlboss community can help provide women with the resources that platforms like LinkedIn have not, filling a niche in a time of rapid social change. This year’s New York rally welcomed 1,100 women from 31 different countries over two days of programming. PSFK spoke to Amoruso following the event for an inside look at how she is using her past experience to build a community of women supporting women across industries and at all levels of achievement. Roseanna Roberts (PSFK) : You’re about a year into running the Girlboss platform? Sophia Amoruso: It’s actually two years. Our first rally was in March of 2017—this is our fourth. We’ve also been creating content on girlboss.com, and our podcast network. Then there’s the product I announced yesterday in terms of bringing the community and this feeling and all this content on to a single platform—we’re in beta. It’s a closed early environment where we have women and they’re using it, but it’s not fully baked. What we shared [at the Girlboss Rally] was an iteration of it that will be completely built the next few months. What do you feel, in the time that you’ve had the platform, that you’ve learned about your community? It really runs the gamut. The general theme is that they’re entrepreneurial, whether they’re in a career or they’re building a career. We have women from Uber, Google, Heineken, women who are really in these incredible positions in their companies. There are entrepreneurs, but there are intrapreneurs. We have these women who’re actually building businesses. Then there’s everything in between, where they may have a career, but they have a side hustle—they don’t know if they’re ready to make it their full time, or face fear about doing so. What do you think is the key to engagement and getting these women to start to have these conversations on the platform? It’s going to be built woman by woman, or relationship by relationship, individually. I don’t think this is something that we can really broadcast because it wouldn’t be as authentic as the way the community has already grown. The hashtag has been used 13 million times. That’s not because of us on Instagram. That’s something they did. In many ways, the Girlboss community has built itself. We’re just showing up now four and a half years a later saying, “Hey, we’re going to give you a place to do this.” We started with Girlboss Rally and we’re taking that online, and creating an environment where it can happen all day every day. Have you seen the conversation change since you first launched? I’d say identity and activism have become a part of the conversation where they weren’t when I wrote Girlboss, because we were in a very different time. I took feminism for granted because I was in my bubble and I thought everyone was already there. I also had the privilege of only having been in companies that I invented or created rather than being in a corporate environment with the kinds of things that we’ve seen come to light. It seems that community is at the core of what you’re building. Could you explain how that’s manifesting through Girlboss, and why also it’s important to create offline experiences? We just want to be the conduit for something that already exists. Girlboss is part of it, but it’s a much, much larger conversation that we’re part of. Experiences are a way for people to have a sense of discovery that we want to replicate online, but I don’t think it’s been done very well. Especially when it comes to professional networking or professional resources. Where you Google something, you might end up on WikiHow or a YouTube video of somebody who’s giving you advice to start a business who’s probably never started a business. Having that level of credibility when you can see people’s faces is really powerful. The way we curate such a diverse group of women on our panels who are seasoned executives to women who are just starting their businesses is important, because our women are at different stages in their careers. Just highlighting people who have had a long‑storied career—there’s a lot of inspiration there and a rich experience that women who’ve been in the workforce for 20-plus years can share, as well as the businesses that are innovating and marketing in new ways. I’m inspired by it because five years ago when I was building Nasty Gal, marketing was different. It’s changed so quickly. It’s a completely different game now. How do you feel like you’re empowering women to participate in your community ? How does their feedback inform what you’re developing? At the beginning of each day, I asked everybody to turn to one another, introduce themselves and exchange either business cards or email addresses. Often you just introduce yourself to someone, maybe you see them later in the day but you don’t have the confidence to ask them to stay in touch. Each one of those relationships creates opportunity. If I hadn’t said yes to so many things over the first 10 years of my career, I’d be in a really different place. Who knew that a book would turn into a second career? What else would I be doing right now? Consulting for fashion companies? In terms of encouraging interaction, we have the conversation pitch. It happens naturally because that’s what people came to do. I opened up yesterday saying, “At some point in your career, have you thought networking is kind of creepy?” Because I have. That word can be kind of creepy. Then I asked, “How many of you came here to network?” Everybody raised their hands. What is the stigma around networking? Is it that we want something from one another? Is it that we have to admit that it’s awkward? What is it? We want to create a place where it’s expected, it’s mandatory. They’re here to take action. With one another, with themselves personally. There are notebooks out, not phones. These girls are soaking it all up and they want to go home and immediately implement what they learned. Have you noticed any ideas or themes at this particular rally that are new? Wellness is the theme. The Museum of Ice Cream founder, Maryellis Bunn, was here yesterday. They’re banning phones from their experiences. That’s a huge risk to their business because that’s been all of their marketing—inherently shareable. What these devices are doing to us and our memory, how much time we spend on them, how they affect our mental health—it has become evident that there’s a negative impact on us. Bumble introduced a news function. and the new iOS can babysit your time. The dopamine rush that this created, companies are now trying to help us solve. Arianna Huffington came on stage yesterday and told us about the sleep revolution that she’s created and everything they’re doing at Thrive Global. She’s really done the grind. The glory of the hustle is over‑glorified. I was partly responsible years ago in propagating that. It’s something I’m a lot more careful about evangelizing, even though it’s important at times. It’s a question of how do you make sure you’re also taking care of yourself? That integration is now essential. That’s what we’re doing with the Girlboss community. It’s a place where you can share not just what you do, but who you are, your personality. Monday through Friday we’re a professional networking platform and on weekends we’re sharing our fun drinking adventures. We’re living all of those together all the time. What would say are the most significant signs of progress based on the female empowerment community? The KPIs we want to tackle: Are these women making more money? Are they making one another richer? How can we facilitate that? Are they negotiating more? Are they starting more businesses as a result of being a part of the Girlboss community? That’s what we want to build this around more than revenue metrics or daily active user metrics. Of course, we want people using the platform. The most important thing is that they’re deriving value from it. Is there anything else that we can expect coming down the pipe that you would like to share? Bigger and better rallies. So much substance comes out of these two days. It’s a lot of work, but it’s easy for us because women are so underserved. One final comment: You’ve been incredibly honest in a lot of the interviews and information that’s out there about you, which really breaks down that barrier so that women can actually start talk honestly and openly. Thanks. I could have gone into hiding, but everything was already headline news. I might as well turn lemons into lemonade. Nothing is really ever a lemon. It’s all an opportunity to learn. Is Waterless The Next Wave In Beauty? What Is Waterless Beauty? The Facts. Refinery29’s sold-out event produced experiences centered on art and activism that went well beyond branding. As New York Fashion Week comes to a close, we look back on one of the hottest tickets in town this season. Refinery29’s 29Rooms had over 20,000 visitors from 45 states and 13 countries—a testament to the far-reaching appeal of the lifestyle media outlet. In its third iteration, Refinery29 brought together a curated selection of independent artists and musicians, brands, and a handful of celebrities who collaborated to create 29 unique installations within a Williamsburg warehouse. The space was a funhouse of color and distraction, like a whimsical Instagram wonderland. Beyond that surface layer, it was an experience with substance, symbolism, and in-your-face activism. 29Rooms tapped into the ways that art and social issues are intertwined, and—if the crowds are anything to go by—people are interested in engaging with this conversation. Below, we highlight five of the 29 rooms that explored feminism, self-acceptance, and other culturally relevant issues head-on. At the entrance of 29Rooms, ‘Erotica in Bloom’ hangs like picture of floral decadence. Upon closer inspection, this swirling world of oversized blooms reveals these flowers as symbols of female fertility. In collaboration with Maisie Cousins, a photographer known for her provocative use of nature as expressions of sensuality, this modern garden of (She)-den invites you in with playful giggles and whispers coming from behind the petals. Short videos are hidden deeper inside the buds, with beautiful imagery celebrating the female body, sexuality and nature. A sweet clean fragrance, like fresh picked wild flowers, lingers in the air, subtly persuading your senses to drift into this dreamscape. We’ve all had those days where we would just love to put on some gloves and take it out on a punching bag. Artist Jen Mussari and drummer Madame Gandhi capitalized on the sport’s current popularity, producing the ultimate creative expression: turning that aggressive energy into music. Hitting one of the punching bags inside this installation activates sounds. Both the bags and the gloves have painted lyrics like “The future is made of what we do each day” and “Fight for the future” to set the tone. The more you punch, the more music you make. The installation celebrates inner and outer strength and the power that can come from them. As you swing into your chair in this conceptual salon, you are transported into the body of a young black woman. This is no ordinary trip to the hairdresser. Hyphen-Labs has created a transhumanistic experience that forces the viewer to walk in another person’s shoes (via her hair), if only for a few minutes. This virtual voyage confronts some larger themes, such as how do we harness synaptic plasticity to free our minds so can we reprogram our mental maps? When will we move past the limitations of our memories, and who is building our future? This experience confronts an empowered future, limited only by one’s own imagination. The women responsible for organizing the January 21 Women’s March on Washington (and worldwide) have created a bustling activist headquarters, engaging passersby while bridging the gap between art and political activism. The point here is clear: Art can be a catalyst for change. Colorfully illustrated postcards carry hard hitting slogans such as “Hope Over Fear” and “We Can. We Have. We Will.” These messages encourage everyone to get involved. Pens, senator’s addresses and an in-house mailbox (and postage) create an immediate call to action in a fun, creative setting. Walking into Room 26 is like a time warp, bringing you back to your first day of middle school, hiding in the bathroom stall at lunch – but this time, all of the graffiti on the walls are kind and compassionate words of encouragement. 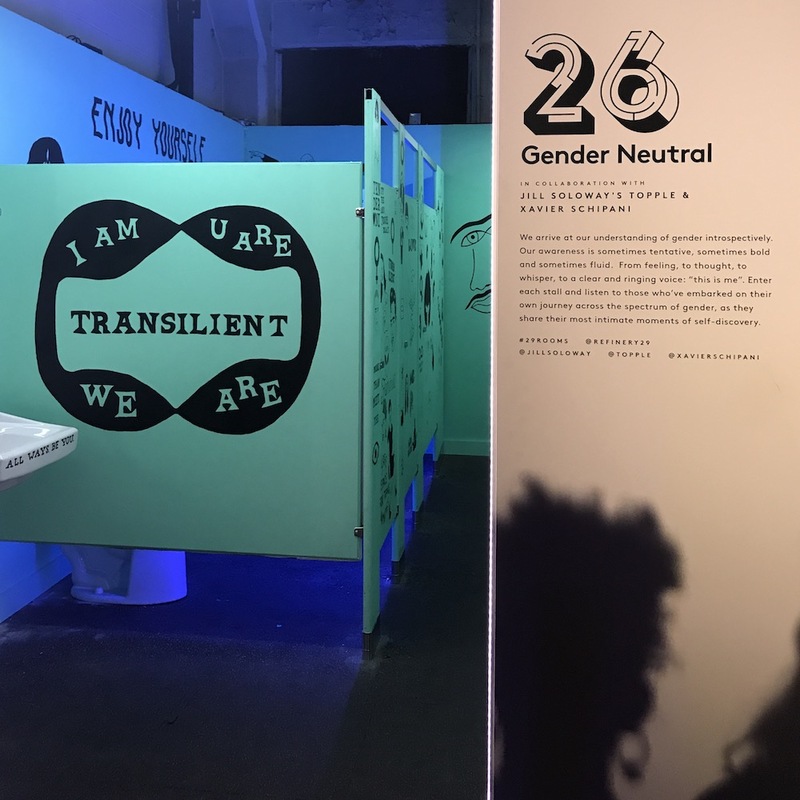 Transparent’s Jill Soloway and artist Xavier Schipani have reimagined a space like those old-school restrooms but in a trans-safe environment that garners feelings of positivity, confidence and love in a time when the place you do your business is everyone’s business. Pink, a color that was once thought of as the quintessential mark of femininity, now represents something quite different in 2017. Beginning in fashion and then quickly adapted by beauty, pink has been reclaimed by women as a modern representation of female strength, repositioning the former ditzy association with the lady-like hue. Women now wear a bold fuchsia lip or pale pink pantsuit as a symbol of female strength. This shift in rosy outlook has been in the works for some time. Over the past decade, the role of women has seen significant change. Women have asserted their position in the workforce (and beyond), becoming confident in their identity, celebrating individuality and creative spirit. Strong female role models, from Beyoncé to Hillary Clinton have encouraged women to lead as women, celebrating the differences from their male counterparts. Instead of rejecting classically feminine colors, they have been embraced. 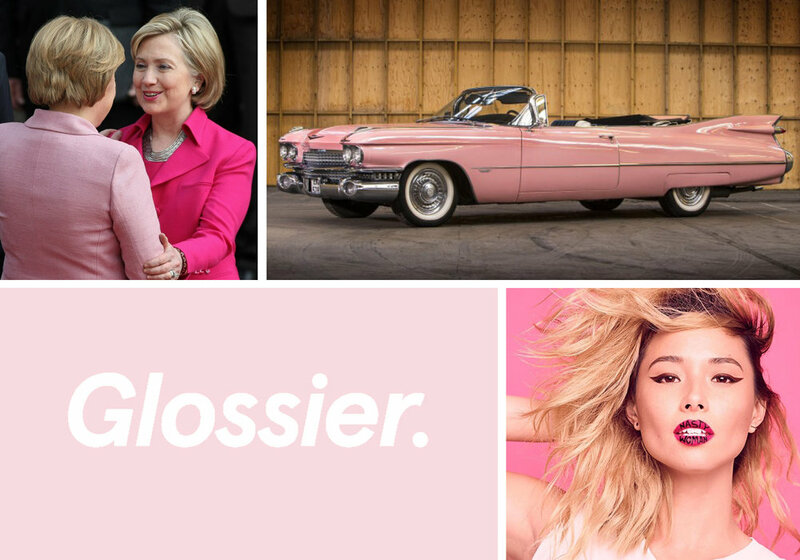 Over the years brands have used the color to appeal to the female demographic – imbuing it with meaning. The cosmetics magnate Mary Kay empowered women to enter the workforce on their own terms, and rewarded hard work by gifting top performers with blush pink Cadillacs. Fast forward to 2017, where “millennial pink” is representative of a “post pretty” movement ruled by ironic, honest beauty. Indie cosmetics darling Glossier is the poster child, wielding the color like a product itself. As businesses start to gain a conscience and align themselves with social movements, pink continues to be a beacon of female strength. Social justice driven brand The Lipstick Lobby donates 100% of net profits from the sale of their signature shade, Kiss My Pink to Planned Parenthood. The high impact color brings attention to the cause, while at the same time being a fresh and flattering tone on the lips. Like kale and avocado toast, Pink is currently having a moment. It is yet to be seen what lies ahead for the hue, but it is safe to say that it is no longer just a color, but a symbol of the modern woman – whether she’s wearing makeup or is au naturel.